From the August 2001 issue of World Press Review (VOL. 48, No. 8). Parliamentary elections held on April 29 in Senegal resulted in a landslide victory for the Sopi Coalition dominated by President Abdoulaye Wade’s Senegalese Democratic Party (PDS). 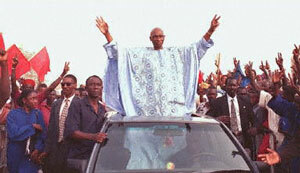 President Wade was elected in March 2000, defeating former President Abdou Diouf, whose Socialist Party had ruled Senegal for four decades. The Socialists, however, had continued to control parliament. No longer: Wade’s 40-party coalition obtained 90 of 120 parliamentary seats, while the opposition collected 30. The Socialists will have 10 members of parliament, against 97 in the former 140-seat house dissolved in February. But the new cabinet’s composition was greeted positively by most commentators. It indicates that Wade has kept his campaign promises, Demba Ndiaye said in Sud Quotidien (May 12): “Six women altogether, including the prime minister herself.” The new administration will go forward with “a small government team, the confirmed presence of women and civil society, the only criteria being competence,” Le Soleil agreed (May 11).